Gotcha! I bet you all thought I wasn't going to post anything but you were wrong.. I got this post in before the stroke of midnight where I'm at in the world right now and it's out of nothing but love for ALL you loyal readers.. I know you were just waiting with baited breath for me to return to the blogosphere after the long weekend and regale you with stories of my celebrations.. And ladies and gentlemen, I am not here to disappoint. Albeit brief, (because I am writing to you from my sick bed) I need to share some cray cray news with you all. And you probably won't believe me but y'all, I tell no lie. Don't be caught wearing anything akin to this from here on out now, ya hear?! 3. The bachelorette's mom came wine tasting (in Santa Ynez, California) with the group on Saturday. After wine tasting, the mother-of-the-bride-to-be went up to Ojai, CA (about 30 min from where we were staying) for a wedding the following day. Fast forward to approximately noon the next day (Sunday) when my fran's mom is in the quiet room at the spa (sidenote: don't go to ojai and not go to the spa) and sitting right behind her is none other than FAT AMY (for those of you who haven't seen Pitch Perfect, shame on you! 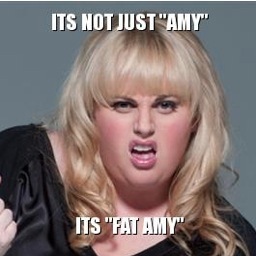 But also, Rebel Wilson, plays "Fat Amy" in the flick). Yeah. I am choosing to believe it was not mere coincidence. Out of respect for the STAR, the bachelorette's mother did not approach Miss Wilson (I can't say I would have been as respectful had it be me in the situation... And I also can't say I wasn't considering driving up there myself as part of a last ditch effort) but all of that aside, I think the universe aligned to transitively have The Rebel Wilson be loosely part of the weddinh activities, by association, if nothing else. Hell to the yeah!